I’m thrilled to be sharing a guest post today. It’s written by Nicholas, who is a 16 year old student from Canada. He is passionate about the environment and aims at becoming an environmental engineer when he is older. When he is not occupied with school, he enjoys playing sports, reading, and spending time with family and friends. Today, Nicholas has written his ideas for reducing waste. He’s sharing some great tips and I hope you’ll be inspired to rethink your rubbish too. For more ideas, visit MyZeroWaste, where you can find out how a family creates less than 100gms of rubbish each week! “Making an effort to reduce garbage is something most individuals strive to do, at least to some degree. Simply recycling the daily newspaper or soda cans, although important, is not sufficient. There are many opportunities for us to reduce our impact on the stressed landfills, but the vast majority of us are not taking full advantage of them. 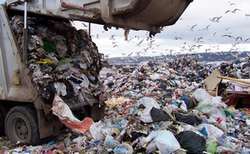 We all have an opportunity to reduce our garbage by a considerable amount- often up to 70 percent. Simply put, don’t buy garbage! Avoid non-recyclable plastics (check with your local recycling depot). Buy products in bulk as, aside from being cheaper, they have significantly less packaging. Buy more durable and lasting products. Ensure that items are reusable and refillable. If shopping for you is a social activity, you need to change that attitude immediately. Only buy things that you really need. – Donate old things to charitable organizations; Examples include clothing or a bike. A great, eco friendly idea is to start a compost bin. Compost allows you to transform organic waste (eg. fruits and vegetables, egg shells) into beautiful, rich soil. Next time you go to buy something new or go to throw something out, think twice about it. Carefully consider if you could you reduce, reuse, or recycle. I wrote a post about an organization called Earth911 that is a great resource for information to help you reduce, reuse, compost and recycle more effectively. Perhaps it can help some people. Thanks for this, TC. earth911 are a fantastic organisation offering a great resource for people. We have similar schemes over here, but it varies slightly. What an incredible article on reducing our garbage. Still amazes me that a 16 year old can be so green. There was one line in particular I really enjoyed. “Simply put, don’t buy garbage! Avoid non-recyclable plastics. ” This is a really a “green how to” no brainer, but something most people don’t even think about. What simpler way to reduce your waste than to not even purchase waste from the beginning. Nice article and I wish Nicholas much success in his green expeditions and ventures! @Ian R.: Hi Ian, welcome to the site and thanks for your comment. I agree, the no brainers are great and it’s good to be reminded of these from time to time before we over complicate things.